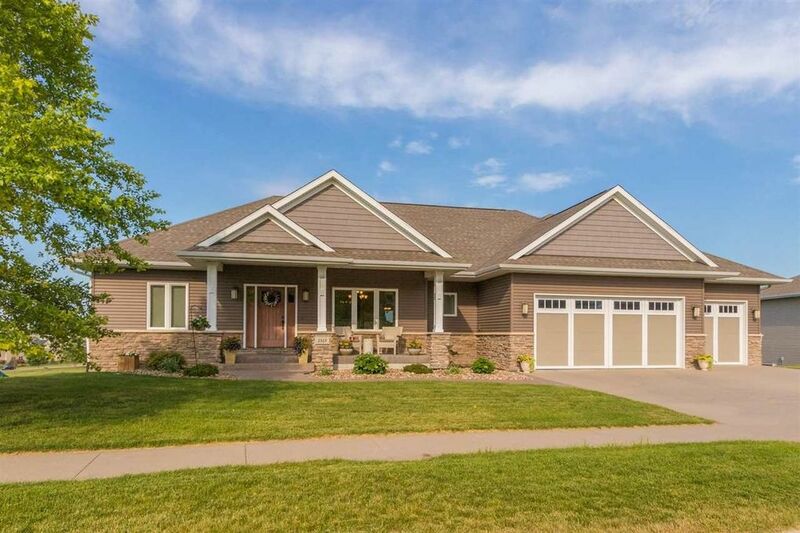 Tremendous Craftsman style home situated on a .80 acre lot high on the hill in Cedar Springs near the end of a cul de sac with unbelievable views of North Liberty and the pond plus a great yard for play/entertaining! This spacious ranch features a 16x16 upper level bonus room/suite with a bath room perfect for an in home office or 5th bedroom; luxurious master suite that boasts a trey ceiling, jetted tub, all tile shower and a 6x13 walk-in closet; living room with soaring vaulted ceilings and a cozy fireplace; elegant formal dining room with a designer triple box ceiling; fantastic kitchen with Hickory wood floors, rich premium cabinetry, upgraded appliances including a gas range/oven, French door style refrigerator, cabinet panel Kitchenaid dishwasher, raised bar, granite countertops and a large dinette; convenient first floor laundry room that comes with the LG front load washer/dryer; handy built-in bench with cubbies; screened porch to take in the views; sweeping walkout lower level with 9 ft. ceilings; family room with negotiable projection screen theater system plus an adjacent rec room perfect for a pool/ping pong table; solid doors with oil rubbed bronze hardware, handcrafted wood columns, and granite vanities; high efficiency equipment including a geo spring water heater; attractive part stone exterior with a front porch and accented with stamped concrete; lots of great storage space; and an oversized 885 sq. ft. (3) car garage! Close to the new/future elementary school! Directions: Front St./Mehaffey Bridge Rd. to Cedar Springs Dr., Right on Silver Maple Trl., Right on Cedar Springs Dr., Right on Cypress Circle.